Kirklin Woodcock remembers it well. It was 2002. Kirklin lived a mile from the highway department. “When I came around the corner, I saw everything I put together disappear in the flames,” he said. “It was hard to comprehend. It took me several months to get my feet back on the ground — with the investigation and being upset about the fire and all that. It was devastating. I had to face the fact that it was a bump in the road. If I couldn't come back from it, I'd have to get out. I'd have to do something else. That wasn't for me. You do what you have to do and keep going. That's what I did. Kirklin was born and raised in the town of Wilton. “I'm a farmer boy, per se. We had a small farm and my father was in the trucking business. He used to haul can milk [farmer's cans]. He had a bunch of those trucks and that's what we used to do from the time we could drag a milk can and help the driver get it on the truck. Kirklin attended Schuylerville Central School before being sent to Fort Dix, N.J., for his basic training. 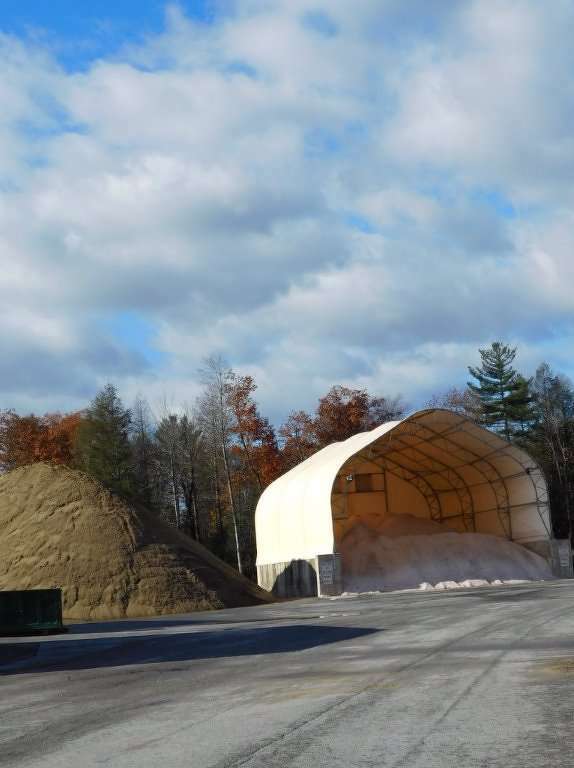 In 2007, the town of Wilton highway department built a modern dome salt shed that holds 1,200 tons. He's been married to his wife, Sandra, for 55 years. They have one daughter, Deborah. Married to Dr. George Siniapkin, they have one daughter, Caitlin, 25. Now, in his 35th year as superintendent, Kirklin reminisces about his road to the highway department. “I wanted a change in my career. I was a UPS driver and on the road a lot. I was there for 20 years. I also worked at the highway department back in the early '60s and for my father's business. As I got older, the gentleman who was here ahead of me was fixing to retire. I thought that would make me a good second career. I knew I was taking a chance at being elected, but I took that chance and I've been here ever since. In what little spare time he has, Kirklin enjoys restoring old cars. Part of Kirklin Woodcock’s 18-man crew that helps serve the town’s 16,000 residents. How did this super get to be an auctioneer? 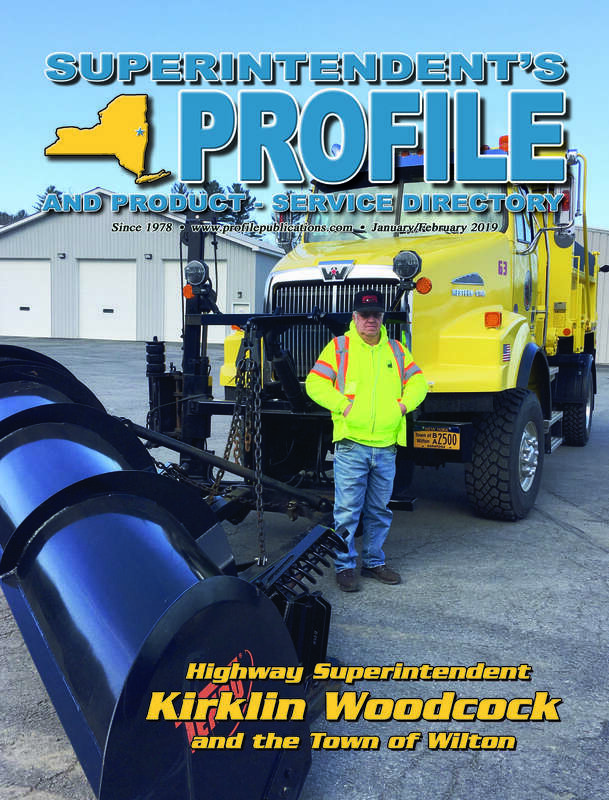 Vice president of the Saratoga County Highway Superintendent's Association and a member of the New York State Highway Superintendent's Association, Kirklin is up for re-election to another two-year term in 2019. The town of Wilton's highway department is spread out among several buildings. The new garage has 24 bays. “Our building is about 80 feet wide and 300 feet long. My secretary, my office and my three foremen are at one end. Then it goes to the west with 12 bays on each side. Our frontline equipment is housed inside. We also have a breakroom, but it's too small because of the growth. At some point we'll have to address that. In his role as highway superintendent, Kirklin is responsible for maintaining the town's 220 lane miles of road, all of which are paved. That translates into 16 plowing routes that take 3.5 hours to clear. Kirklin's 18-man crew helps serve the town's 16,000 residents. Full-time staff includes foremen Frank Holden, Rich McCane and Mike Monroe; mechanics/MEOs Tom Hammond and Jonathan Hoffman; MEOs Jake Beaudet, Jason Brueckner, Dave Coffinger, Josh Harrington, John Helenek, Lewis Jenison, David Locke, John Phillips, Dan Salmonson, Tony Santiago and Tyler Sarro; laborers Dave Counter and Bill Dowd; part-timer Mark Welden; and Lori Olson, highway secretary. While Kirklin's drivers have their CDL, he thinks that may be a thing of the past. 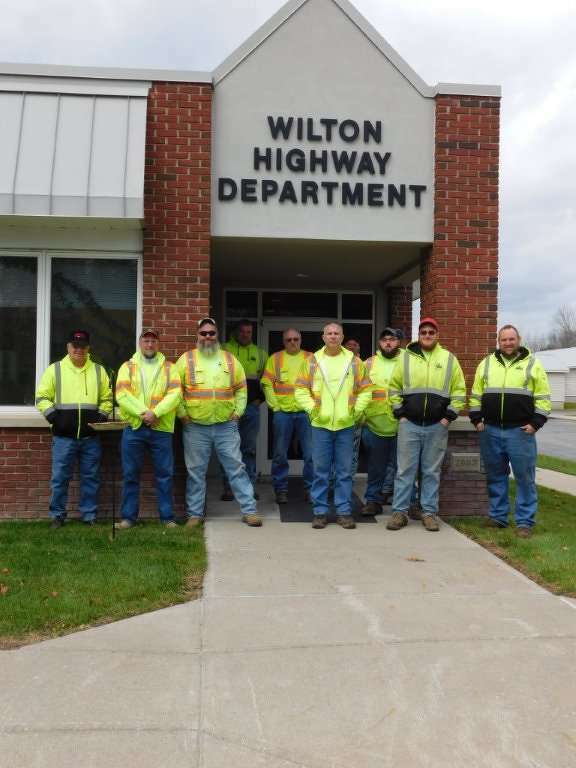 The town of Wilton's highway department runs on a total operating budget of $3.5 million. That includes employee salaries and benefits and an annual CHIPS allocation of $156,169; $35,000 for PAVE-NY; and $27,000 for Extreme Winter Recovery. Every highway superintendent prides themselves in having an up-to-date fleet. For Kirklin, that's easier said than done. “We have a program in place that the town board is supposed to abide by. We're trying to replace big trucks, dump trucks, pick-ups, on a yearly basis. Sometimes it happens and sometimes it doesn't. With my new liaison with the town board, I was told they're going to replace one of my big trucks every year. If that's the case, I'll have vehicles that are 16 years old before they get replaced. The highway department also has a computerized fuel system. Like most other towns, money and trying to get things done is difficult. Wilton is no exception. “It's frustrating when you know you have certain things to do and you can't get them done because of monetary reasons or it's put off longer than it should be. Then you have to spend more money than if you jumped on it right away. You have a sidewalk that's all crumbled up, so go fix it. Oh, we can't do it this year. We'll do it next year. Well it's going to cost more money next year. With money in short supply, when asked what he'd do if someone gave him a big bag of money, Kirklin was quick to respond. Now, 35 years in, Kirklin admits the job has been everything he expected. By the way, Kirklin received his 30-year award this year. The one common link between the Native Americans, early settlers and present-day residents of Wilton is “Love of the Land.” As the Iroquois were attracted by the forests, streams, mineral waters and good fertile land, so were the first pioneer families. Trails used by trappers and traders crossed Wilton both North-South and East-West. In 1693, there was a three-day battle near one of these crossings between British troops under Peter Schuyler and parties of French and Indians. The battle took place near Stiles Corners. Neither side could claim victory, but the skirmish is known as the “Battle of Wilton.” The site is noted by a historic marker at the corner of Parkhurst Road and Gailor Road. The first settlers came to Wilton, or Palmertown as it was known earlier, between the French and Indian Wars and the Revolution. In 1764, the Brisbin brothers began a saw mill on the Snook Kill, which comes tumbling off the Palmertown Mountain Range in the North west section of Wilton. After the Revolution, the families of Stiles, Kings, Phillips, Laings, Perrys, Emersons, Dimmicks, Johnsons and McGregors left their marks as well as their names on many small hamlets such as King's Station, Stiles corners, Dimmicks corners, Emersons Corners and Mt. McGregor. Emersons Corners was named for Broadstreet Emerson who owned a Tavern circa 1790 that was the first seat of government in Wilton. The site is marked by a historic marker at the corner of Ballard and North Roads. In the late 1800s, a bottling plant distributed the Gurn Spring Mineral Water and the area was then known as Gurn Spring. The Spring was closed in the early 1900s. The Gurn Spring Methodist Church circa 1885, the South Wilton Church and the Wiltonville Church 1871 are still in existence, but no longer operate as Methodist churches. The combined congregations now occupy the Trinity Methodist on Ballard Road. The McGregor brothers came from Scotland in 1787 and settled in an area near Palmertown. They began farming and operated a gristmill soon after they arrived. Duncan McGregor built a small hotel atop a mountain, which became known as Mt. McGregor. The Hotel Balmoral, a grand luxury hotel, was built on the mountain in 1883 and was destroyed by fire in 1897. General Ulysses S. Grant died of throat cancer on July 23, 1885, in what would later be named Grant Cottage. He had arrived at the cottage from New York City on June 16, with his family, servants and doctors. He was able to complete his memoirs in the short time he had left. Today, the cottage remains essentially the same as during the Grant family's stay. Visitors tour the downstairs of the cottage, viewing the original furnishings, decorations, and personal items belonging to Grant, including the bed where he died, and floral arrangements that remain from Grant's August 4th funeral. There also is a short path to the Eastern Outlook, which commands a spectacular view of the Hudson Valley, from the Adirondacks in the north, the Green Mountains of Vermont to the east, and the Catskills to the south. The Visitors Center offers interpretive displays and exhibits, a short introductory film, and a gift shop filled with books, memorabilia and numerous Civil War-related items. Grant Cottage is owned by the State of New York and opened to the public by The Friends of the Ulysses S. Grant Cottage Inc. There are approximately 10 miles of trails open to the public in the town of Wilton for a variety of non-motorized uses. Approximately 25 acres of the 310-acre Camp Saratoga is owned by the town, which includes five miles of trails for hiking pleasure, beautiful Delegan Pond for fishing, cabins and a pavilion for community and group activities. Each location offers its own environmental benefits for public enjoyment. In 1996, The Nature Conservancy and its partners established the Wilton Wildlife Preserve and Park as a special community-based conservation program — a balance between people, community and habitat. The program's mission is to preserve the land, ensure the survival of native wildlife and natural communities, protect and provide habitat for the federally endangered Karner blue butterfly, create a natural area for education and recreation, and maintain the rural character of the local community. Wilton Wildlife Preserve and Park is a nonprofit organization. Its mission is to conserve ecological systems and natural settings while providing opportunities for environmental education and recreational experiences. Visitors also can climb an authentic fire tower and view a replica fire observer's cabin without having to climb a mountain! Get a treetop view of Wilton Wildlife Preserve & Park. This 60-foot, Model LS-40 Aermotor fire tower was placed in memory of Thomas C. Luther, who founded The Luther Forest in 1898 and who was an entrepreneur and pioneer in the world of forestry. In memory of Thomas F. Luther and William R. Mackay who carried on The stewardship of The Luther Forest for two more generations as professional foresters. And to further Honor Thomas F. Luther, a stout supporter of the Boy Scouts of America and a Charter member and First Commissioner of the Saratoga County Council, instrumental in the creation of Camp Saratoga in 1930, and a 1943 recipient of the Silver Beaver Award.